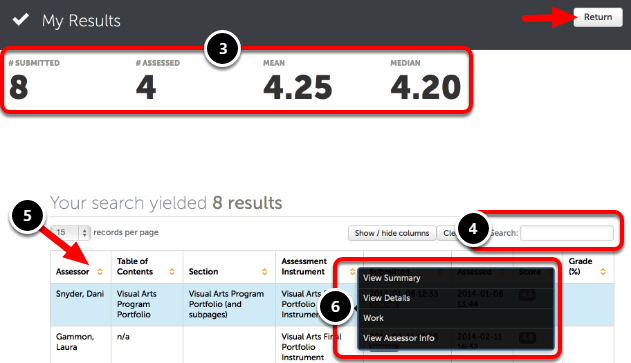 Support DocumentationStudent FAQWhere can I view my assessment results/grades? 2. Click on the My Results option. 3. View a summary of # of Submissions, # of Submissions Assessed, the Mean, and the Median. 4. If you have many submissions, it may be easier to use the Search bar to locate a specific one. 5. Use the Column Headings to adjust how your submissions are being displayed. 6. 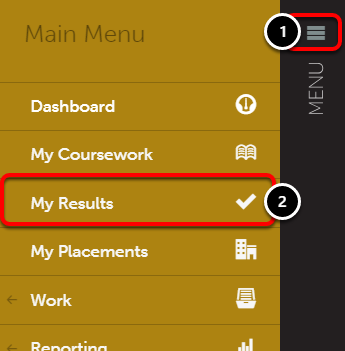 By clicking anywhere on a submission's row, you will reveal the options to: View Summary, View Details, and Work. View Summary: This will prompt a pop-up window displaying a summary of the assessment. View Details: This will redirect you to a page displaying an extensive view of the assessment, including overall comments and uploaded annotated documents, if applicable. Work: This will redirect you to a page displaying the work that you had submitted for this assessment. To return to your Dashboard, click the Return button. Prev: How do I withdraw a submission that I made to my assessor? Next: How do I share my portfolio with someone who doesn't have Chalk & Wire?